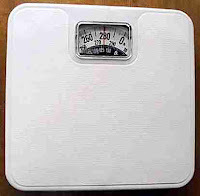 Use a flat, ordinary bathroom scale; this works a lot better with non-electronic scales. Each person holds the scale with two hands and squeezes it, pressing as hard as possible to register the highest weight on the scale. Or, you could have two people, one holding the scale and the other pushing, attempt to register their highest weight on the scale.